the atacama desert on the pacific coast of chile is reckoned to be the driest place on earth. the average rainfall is around 25 millimetres per year, and some parts of the desert, we are reliably informed, have not experienced a single drop of rain in over 400 years. and it's not exactly a small parcel of land we're talking about: it stretches about 1000km from peru's southern border into northern chile. there's no grass, cactii, lizard or even a midge. it is so dry in this part of the world, that even steel doesn't rust. pete tomkins is very unlikely to sell many pairs of roadracers in this locale. 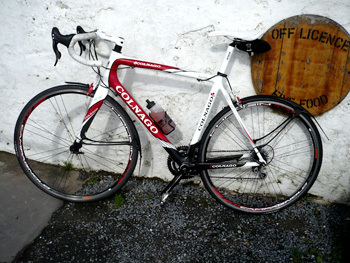 you'll be hard pressed to find a dyed-in-the-wool roadie who puts mudguards on his pride and joy; lancedoesntdoit.com. we all know it would be a more than practical thing to do, particularly if you live in the united kingdom or somewhere around portland and seattle, because a lot of precipitation has an affinity with gravity in those areas. but the old adage, 'pride bears no pain' has to be perpetually chanted when sitting in the middle or the back of the sunday peloton now that autumn is officially here (would i lie to you?). because the bicycles in front of you will be perpetuating a constant stream of water on those tinted rudy projects while your rear tyre is creating a brown racing stripe on the back of that white training top. but we put up with this because skinny tyres just look completely naff and thoroughly unprofessional when in such lycra'd company. imagine your embarrassment as cavendish speeds past on his unadorned scott. the other reason we put up with this state of affairs, is a complete lack of mudguard eyes on modern carbon fibre; if you'd managed to swallow your pride, be willing to succumb to endless taunts from the peloton, all for a few hours of pragmatic pedalling, how the heck are you going to cram a pair of guards under those dual pivots? and how do you affix them to that carbon b-stay? ugly doesn't begin to describe it. but this is the 21st century, and we can do anything we like™ or at least there are those amongst us that can. pete tomkins has been obsessed with crud (in the nicest possible way) for quite a number of years. this is the man who developed the crudcatcher, affixed to the downtube of every self respecting offroader during the early nineties, produced in colours to match the ever changing anodised components of the era. but now the man's fertile brow has turned its considerations to the world of bendy bars and skinny tyres, happily from our very own perspective, and invented roadracers: roadie mudguards that you barely notice even when your'e looking for them. true: one piece of promotional material i have seen for these guards has them affixed to a trek madone, except i thought it was a before and after, and they'd missed the after. they are that subtle. fitting is a finicky operation if only becasue there are small parts involved, and hardly any of us read the manual (actually, the obverse of the header card) unless all else fails. each guard is fashioned from glossy, thin, black recyclable plastic and arrives in three parts; the front and rear sections are fixed in place using a tiny screw and thumbwheel. there are two stays which stretch from the rear and also screw onto two small brackets that are double-bungied onto front forks and rear seatstays. these bungies are a lot stretchier and stronger than you'd think, meaning that even chunky carbon is accommodated with ease and a strong thumb and forefinger. 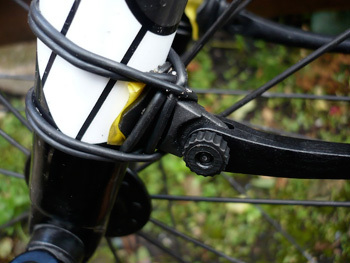 the assembled guard is held in place by a re-usable zip-tie fastened through a slot on top of each guard and round the centre bolt of the brake calipers. an excellent example of lateral thinking. 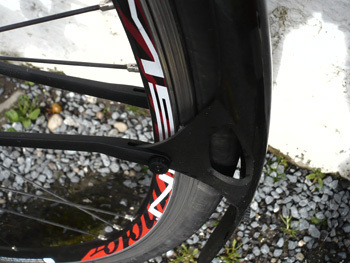 this clever invention is made aesthetically and practically possible on skinny tyres by reducing the plethora of stays that normally plague mudguards of other hues. the stay flanges moulded onto the main section of each guard are fitted on the inside with small brushes that touch on the wheel rims. it is these that keep the raceguards centred over the wheels without the need for a numerical increase in stays. 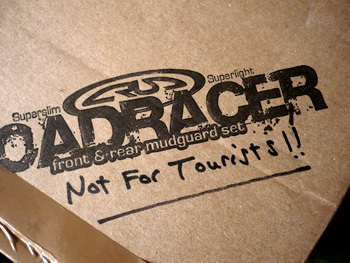 crud claim that the drag factor is negligible and that in testing they have yet to wear out a pair of brushes. to test my review pair, i have risked incurring the wrath of cambiago, and fitted them to a 2010 colnago ace that arrived at the same time as the roadracers. sacrilege it may be, but i am nothing if not fearless in the face of ernesto. it took around 45 minutes to fit both guards, and while it's a bit of a footer, it should be well within the abilities of anyone who can pump up a tyre. just be careful not to drop any of those tiny screws, because they're a bugger to find next to the coal bunker. visually, the roadracers have so little impact on the appearance of the bike, that any possibility of dented pride in the face of practicality rapidly disappears. much like many a real mudguard, these also resist sitting just the way you'd like them to, particularly in this case, the section forward of the rear brake heading towards the seat tube, and the frontispiece that you can see ahead of the for'ard caliper. of course these are so narrow, that any degree of off centredness is mere millimetres and something that is minimised once travel is underway. on the bike, gear selected, pedalling commenced, the rubbing noises at low speed do not augur well, and i stopped a couple of times in a few hundred metres to try and adjust from where i thought the source of the friction emanated. of course, none of this really matters, because much of the sound comes from the brushes sitting lightly on alloy rims, sound that merges into road noise as speed increases. five minutes after get go, i had forgotten there were mudguards on the bike, as had the back of my jacket, socks and shoes. like a kid with a new pair of pink wellies, i was heading through every puddle i could find; and in the aftermath of several heavy showers, this wasn't an onerous task. these are truly brilliant - they work just as well as, if not better than advertised, they make no creaking and rattling noises, have no discernible effect on forward motion and riding over rattly roads bothers them not one whit. according to mr tomkins, the stays are glass reinforced plastic, meaning that should one loosen and flay into the spokes, it will break up without damaging the wheel. hopefully i won't be finding out about that bit. mr hastings wanted a pair the moment he saw them, and in the light of the impending weather forecast, they will be remaining on the colnago for the duration of its test period. portland and seattle, this means you.